It doesn’t end there, the dinner jacket should be made in wool and the lapels and trousers of silk or a contrast material. Look, we don’t want to stick to the rules in this post but here is Menswearstyle’s contribution to the more formal interpretation of this look. Let’s have some fun now. Whilst we would never encourage you not to make an effort (quite the opposite) and just wear a work suit, we would say bend the rules a little if appropriate. Maybe the basics of a white dress shirt and DJ would be good to stick to. 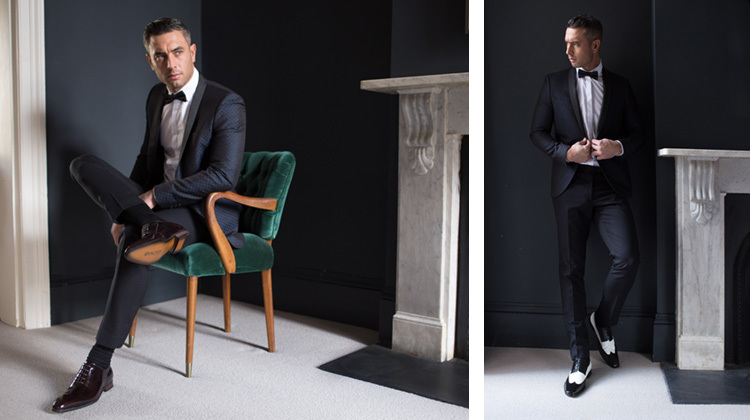 But why not play with the colours and textures of the tux. We love the idea of bronze or midnight and petrol blue in a silk jacquard. Imagine the iridescence in twinkly lights. Not flash enough? Take a peek at Ryan Gosling working it in an electric blue ensemble. Create a decadent vibe with velvet. Whether it is the jacket or the bow tie, there is a brooding lux in the texture of this fabric. A dark green or maroon would really create drama. Always wear plain black trousers with this however or you could start looking a bit Willy Wonka. Illicit your darker side with this concept and have a glass of absinthe on us! Another way to stand out from the crowd is with your shoes. Of course a black patent oxford is the way to play safe BUT what not a burgundy patent pair or as we show you above, black and white spats. Check out our formal shoes for ideas and our pinterest page dedicated to this for more. ← How Do I Clean My Suede Shoes?